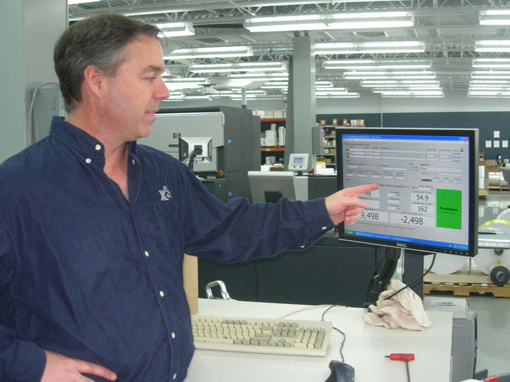 When they opened Innovative Labeling Solutions in 1996, Jay Dollries and his partners started a very conventional flexographic label printing operation. Nearly 15 years later, ILS—as the company is widely known—has evolved into quite a different company. The change began when Dollries became intrigued with the opportunities offered by digital printing. But unlike many printers, Dollries did not merely layer on a digital press as an adjunct to a much larger flexo operation. Instead, he sought to add digital printing as an entirely separate business proposition. The first ILS digital press—an HP Indigo ws4500—was installed in 2005, and a second followed in 2006. A WS6000 was added in 2008 and in 2010 both original Indigos were upgraded to WS6000s, making ILS the first printer in the world with three of the powerful HP Indigo narrow web presses. The three digital presses, together with the original four ILS flexographic presses, are housed in a 65,000 square foot facility in Hamilton, Ohio, a northern suburb of Cincinnati. ILS closed 2010 with some $10 million in sales, of which half was produced by the HP Indigos. “We expect that by 2015, more than 70 percent of our sales volume will be run on the HP presses,” observes Dollries. The strategy—which has taken ILS sales to 50 percent digital and is designed to take the digital component higher yet—hinges on a business plan that is unique among label converters. Rather than simply converting short-run jobs from flexo to digital, ILS employs a different strategy, developed by the leadership team. Kathy Popovich, ILS Director of Marketing and Communications, says: “Of course we do short-run and variable data work on the digital presses, but our sales focus is on helping clients develop entire label and packaging programs which draw on the strengths of our digital presses: print-to-demand—which means lower inventory obsolescence—and the ability to deliver premium quality graphics with virtually no design or run length limitations. The ILS sales approach involves developing strategic partnerships. According to Popovich: “We focus on informing brand managers and marketing executives, by discussing our ability to deliver design intent, and the essence of the brand on shelf. We try to move clients away from their traditional frame of reference—that design is limited by what conventional flexo presses can produce—and demonstrate our ability to produce process color accurately and consistently. Dollries’ background as an engineer means that he brings a focus on information technology to the business. In fact, he developed a custom print business management software package which served the company well until 2009. But at that time, and with his transition to digital printing well under way, he determined that ILS would be better served by commercially available software maintained on a full-time basis by professional programmers. After a brief review of the software available, Dollries selected Label Traxx, a software suite developed specifically for label printers and converters by Tailored Solutions of Milwaukee, Wisconsin. Discussing the Label Traxx selection and implementation, Dollries commented: “I first met Ken Meinhardt [the Label Traxx president] when I was moderating a group on social networking at the 2009 Dscoop meeting. He seemed like a reasonable, concerned, software developer who was willing to listen to prospects and learn about their problems. Our implementation went smoothly. Because I had written our old software, I knew exactly how to transfer data to Label Traxx. We ran the two systems in parallel for a month, and then pulled the plug on the old one. Our employees adapted quickly and the installation was relatively painless, although not all modules are fully implemented. For example, we have yet to open up our E-Traxx module for customers to do their own estimates and quotes.” But the most striking thing about how ILS uses Label Traxx is the collaborative spirit the two companies have adapted to their mutual benefit. Dollries says: “Although we are a Label Traxx customer, we feel much more like a Label Traxx partner. The developers at Label Traxx—including the company president, Ken Meinhardt, who is directly involved in everything the company does—have listened to our needs and have produced several software and hardware enhancements that let us run more efficiently. We were the beta site for their new Auto Traxx encoder and direct press data collection software.